City State is designed as a campaign introduction to an AFTERMATH! world. It forms the beginning of a campaign set in Chicago and the Illinois River Valley - although the information contained herein could potentially be used to set a campaign along any river open to navigation. The situation presented herein includes the political situation within the city of Chicago and the current City State based in the mid-western city. It also includes the political and social structure along the river valley that serves as an avenue for both trade and expansion for the growing City State. It is along this network of waterways that the City State comes into contact and growing friction with its neighbours. 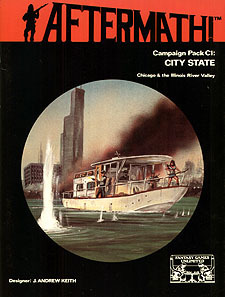 In addition to the campaign background and data on the various communities in the city proper and along the river, City State also includes introductory adventure material to get a campaign started in this setting. City State is not a complete game but a background package for use with the AFTERMATH! game system. AFTERMATH! is required for play.